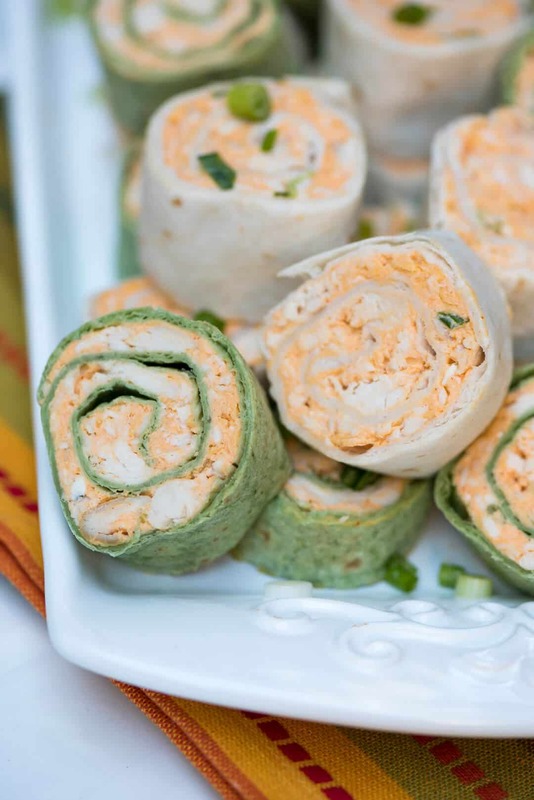 The totally irresistible flavor of Buffalo chicken wings all rolled up into a portable party snack. 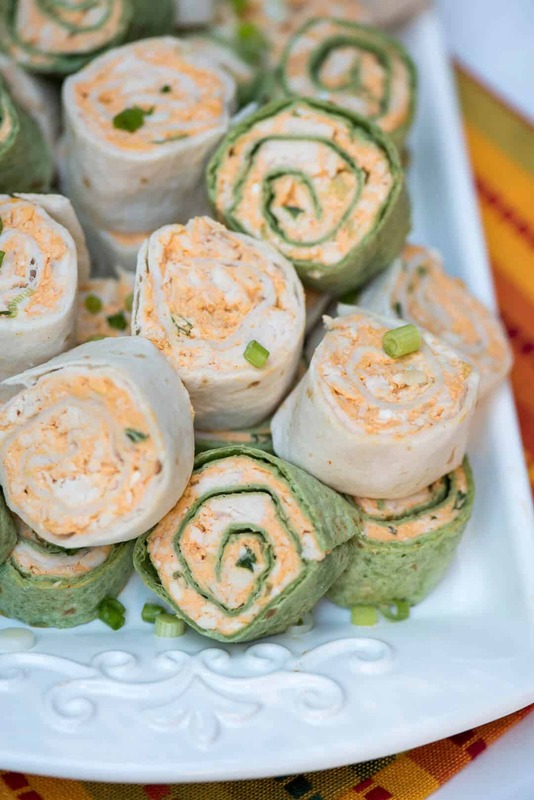 These Buffalo Chicken Tortilla Pinwheels are guaranteed to be a hit at your next gathering! 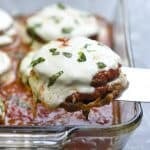 These flavor-packed babies have been on my list to share with you for such a long time. 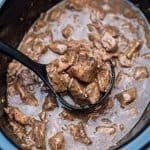 I’m not breaking any new ground with here since this idea has been recreated over and over again by countless others for years now, but they’re so delicious and just so perfect for entertaining they definitely deserve a place in the archives. Plus, like I always do, I’ve put my own little spin on them that I think makes them pretty special. 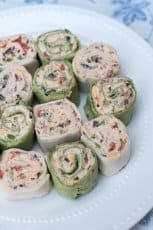 When I shared my Southwest Chicken Tortilla Pinwheels several years ago I found out just how much love people have for things rolled up in tortillas. I hear you! The portability combined with the fact that no utensils are required make them so convenient for making and taking to potlucks and parties. And, then there’s the deliciousness factor. When you mix cream cheese with a little Ranch dressing, sour cream, three kinds of cheese, and good ole’ Franks Red Hot Buffalo Wings Sauce, you’ve got a pretty incredible flavor combination on your hands. 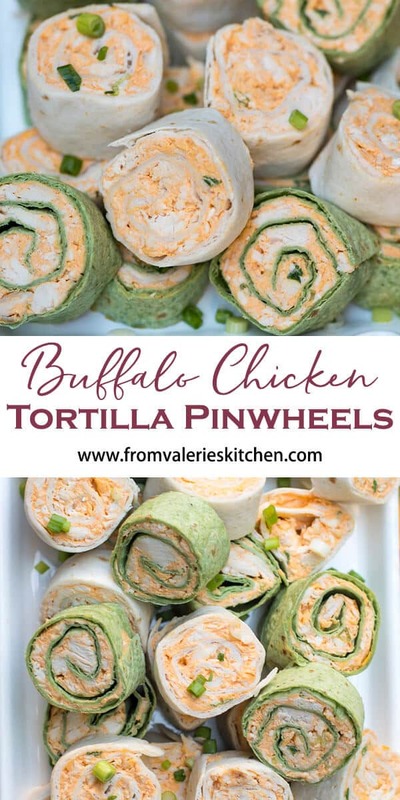 These tasty Buffalo Chicken Tortilla Pinwheels have made their way right up there on my list of favorites and if you give them a try, I have a feeling you’re going to agree. 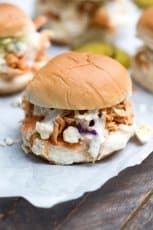 I was inspired by my version of the world famous Buffalo Chicken Dip when I made my filling for these. It includes cream cheese, Ranch dressing, sour cream, green onions, cheddar, Monterey Jack, and just a touch of crumbled blue cheese. 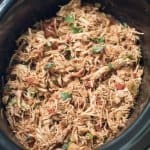 I used the meat from a rotisserie chicken to make this SO easy. About the blue cheese. If you love it, add more. If you don’t, leave it out completely. 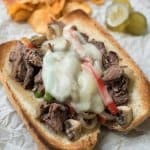 I use just a little bit because it’s got such a robust flavor if you go too far it will overpower the recipe, but I strongly feel that anything Buffalo has got to have at least a touch of blue cheese involved. 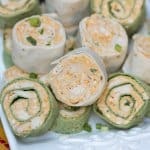 I almost always use both spinach and regular flour tortillas when I make pinwheels for fun color contrast. 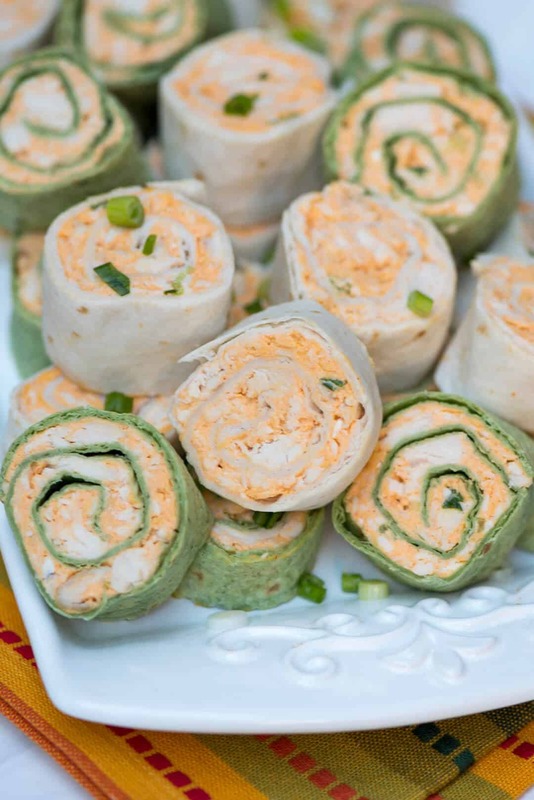 These should be prepared and rolled up at least a couple of hours before your gathering. 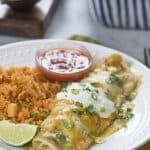 Wrap the rolled tortillas tightly in plastic wrap and refrigerate them until just before your guests arrive. Then just slice them up and you’re ready to go. 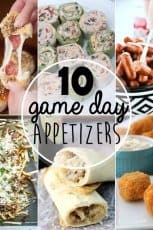 Awesome for game day, backyard BBQ’s, or potluck buffets. My guys here love them for a light snack anytime. Use a hand or stand mixer to combine cream cheese, Ranch dressing, sour cream, and Buffalo wings sauce. Mix until creamy. Use a spoon to stir in the chicken, cheddar, Jack, blue cheese, and green onions. Divide mixture between the tortillas, spreading out evenly leaving about a 1/2" border at the edge. Roll up tightly. 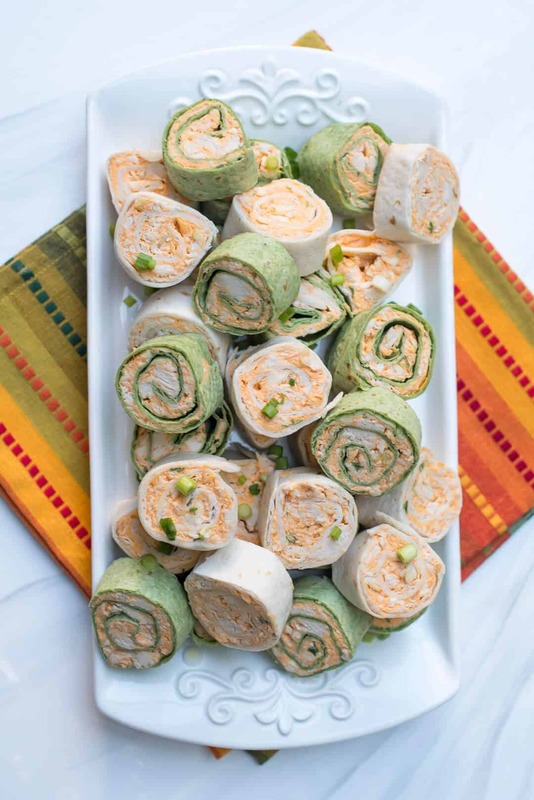 Wrap rollups tightly in plastic wrap and transfer to the refrigerator to chill for at least an hour or until ready to serve. 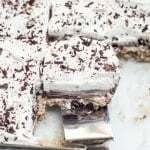 Remove from refrigerator and use a sharp knife to slice into 2" pieces. 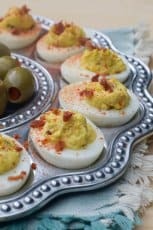 You could also add just a bit of celery to these for a contrast in texture. Also an easy recipe to lighten up with low fat cream cheese, sour cream, and cheddar cheese. Maybe a dash of celery seed would be good, if you didn’t have celery on hand.